The biggest disappointment regarding Living Colour’s Mixtape is right there in the title. It’s an EP, rather than their long-anticipated full-length, Shade. Still, any new music by Living Colour is cause for celebration. As new music goes, Mixtape is a fantastic ride – dominated by a raucous remake of Notorious B.I.G.’s “Who Shot Ya.” Living Colour founder and guitar god Vernon Reid delivers yet another legendary performance; however, vocalist Corey Glover is not to be outdone by his bandmate or a series of guest vocalists that include Chuck D of Public Enemy, Prodigal Sunn, Black Thought of the Roots, Pharoahe Monch and Kyle Mansa. Bassist Doug Wimbish and drummer Will Calhoun lay down an economical back beat, totally sympathetic to the theme, as Living Colour offers no less than seven different versions of “Who Shot Ya” on this EP. Each remix shows off the strong back beat, while underscoring the lyrical heft. An added bonus to Mixtape is the song “Regrets,” which may be a take from the aforementioned Shade LP. 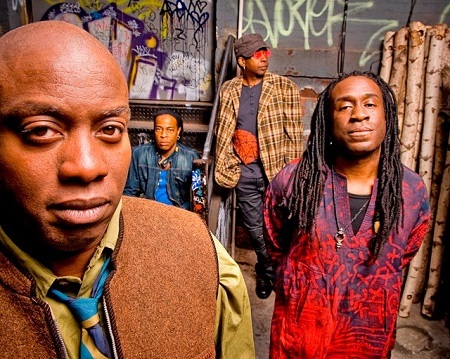 Glover burns with passion, and Living Colour plays around with a smart mix of funk metal. Unlike the song “Who Shot Ya,” with its commentary of urban violence and an aggressive police state, “Regrets” is much more personal — but no less effective. There’s also a stirring all-instrumental version of the song also included. The one mystery on Mixtape is “This Place Hotel,” a cover of a Jacksons song from 1980’s Triumph album. Here, Living Colour adds an edge, which was never anticipated by the young men from Indiana. In any case, Mixtape is a joy to listen too repeatedly — at least until Shade finally arrives.